Having high self-esteem is something that everyone needs, but something that is not necessarily easy to come by. Children especially need help developing high self-esteem, because low self-esteem can manifest into problems such as depression, eating disorders and, in extreme cases, even suicide. As a parent, one of your many jobs relating to your child is to help build up your child’s self-esteem. It’s important to really listen to your child and value what he is saying. You also want to avoid criticizing or belittling your child, as this can lay the groundwork for low self-esteem. Teach by example; by showing your child that you have strong self-esteem you can pave the way for him to follow in your footsteps. These 20 blog articles will give you the tools you need to help improve your child’s self-esteem. Showing pride in your child’s accomplishments will help him feel pride in himself. Listen and respect your child when he’s talking to you, just as you would want him to respect you when you are talking. Empower your child by giving him choices and letting him run with whatever he chooses. These five blog posts will explain different techniques that can help you improve your child’s self-esteem. How to Improve a Child’s Self-Esteem You’ll find advice and suggestions on how to help improve your child’s self-esteem in this post. 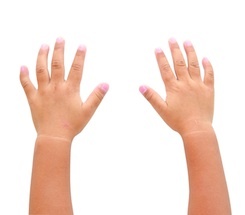 Self-Esteem in Children: Are You Damaging Your Children’s Self-Esteem? Ask yourself the questions posed in this blog post to see if you need to make a change in your behavior. How to Improve Your Child’s Self-Esteem Follow this list of techniques to help your child improve how he sees himself. Stop and Listen to Children Show your child respect and he will respect himself. How Parents Can Improve Their Child’s Self-Esteem? Praise your child and make sure you give him choices so that he feels empowered. When a child has Attention Deficit Hyperactivity Disorder (ADHD) he may feel like there is something wrong with him when he compares himself to his peers. As a parent, it’s important that you help your child see his ADHD in a positive way. This is another opportunity to lead by example. Learn more about how to improve the self-esteem of children with ADHD through these five posts. 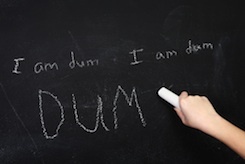 Enhancing Self-Esteem of Children with Attention Deficit Hyperactivity Disorder It’s not unusual for a child with ADHD to compare himself to his classmates. These comparisons can make him feel poorly, so it’s important to learn what you can do to change those feelings. Best Sports for Kids with ADHD Excelling in sports can improve your child’s self-esteem, as noted in this post. Kids and ADHD Often kids with ADHD feel that they are broken; the important task for the parent is to turn ADHD into a strength instead of a defect. 10 Ways Pets Improve Your Health Taking care of a pet will help a child with ADHD to be more responsible, and the love of the pet will improve his self-esteem. Your Brain is a Ferrari Help your child understand that his brain is a gift. When he understands that, he will be better able to work with it, allowing him to go much farther in life. Children with low self-esteem often isolate themselves, which makes the situation worse. Because of this, it’s important that you help your child improve his social skills and make some friends. Having friends will give him a better outlook on life, which will help his self-esteem improve. For more tips like these, look at these five blog posts. Improving a Child’s Social Skills Teaching your child how to make and keep friends will help improve self-esteem. Self-Esteem and Social Competence of the Adopted Child The relationship a child has with his father and his mother are important for different social reasons. Getting Sporty By getting involved in sports, your child will learn social skills. This can, in turn, help improve his self-esteem. 10 Reasons to Add a Pet to the Family this Summer There are many benefits that stem from taking care of a pet, which can help your child improve his self-esteem. Is My Child in Danger of Becoming a Bully Bullies often have a low self-esteem; you’ll want to watch for the warning signs outlined in this post to make sure that your child isn’t a potential bully. The teenage years are formative years that can be very difficult for teenagers to navigate through. Teens are often unkind to each other, and your self-esteem can suffer when you are the one being ignored or talked. As a parent, it’s important that you keep the lines of communication open with your teen. Try not to judge when your teen tells you what is going on with her. Take a look at these five blog articles to read more about what you can do to help improve your teenager’s self-esteem. Four Helpful Thoughts for Kids & Teens to Build Self-Esteem By teaching your child to reframe negative self-talk, their self-esteem should improve. Improve Self-Esteem in Teenagers Sometimes self-esteem can be improved simply by spending more time with your teenager. Self-Esteem Building for Teens: Summer Activities Staying active and taking part in certain activities can help improve your teen’s self-esteem. Improving Your Teenager’s Self-Esteem With all of the changes that occur during the teenager years, it can be a difficult time to navigate through. Learning to deal with these changes can help with self-esteem. Improving Your Child’s Self-Esteem Through Exercise Regular exercise can improve self-image, which can go a long way to improving self-esteem. Working as a nanny is a rewarding and exciting experience, but it can also be a difficult one from time to time. Accepting a post with a brand new infant and first-time parents is often one of the more challenging occurrences that a veteran nanny faces, but it doesn’t always have to be. As a childcare provider, your first responsibility is to the child under your care. As the employee of parents, however, you’re also there to provide support and assistance in any way that you can. Brand new moms can run the gamut from terrified to completely overwhelmed, and helping them to adjust to their new role in the world can not only give them the assistance they need, but also help to create a better and more enjoyable working environment for you. These are ten of the things you can do to help brand new, first-time moms when they need it most. Support Her Feeding Choices – While everyone from the World Health Organization to the La Leche League asserts that breastfeeding is the best and most nutritious choice for a baby, that doesn’t mean that all moms will be successful in their endeavor to breastfeed. Some may also opt for bottle feeding from the beginning for reasons that are solely their own. Regardless of how they choose to feed their new baby, realize that you’re not there to criticize them. Your job is to care for the baby and to ensure that he’s fed, not provide a single shred of commentary about what’s in his bottle. Respect Her Parenting Style – Pregnant parents will read everything they can get their hands on, and may have their hearts set on a specific parenting style endorsed by a self-proclaimed expert long before they bring their new bundle of joy home from the hospital. Unless it’s actively harming the baby, however, it’s not your place to comment on that parenting style or to detract from it through your own actions. More often than not, unrealistic parenting styles and rigid rules about baby care will fall to the wayside as a new mom hits her stride and becomes more confident. Allay Her Fears – Regardless of how together she may seem, it’s a safe assumption that your new mom boss and first-time mommy is at least a little frightened at the prospect of parenting. She may even be downright petrified. As an experienced childcare provider, you can help to make her more comfortable by allaying any fears you can along the way. Gently reassure her that she’s doing a great job and that she’s adjusting to parenthood beautifully. 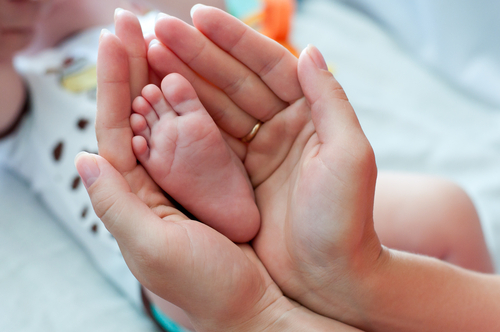 Providing Extra Support to Post-Surgical Moms – Giving birth naturally is difficult enough; going through major abdominal surgery to bring a new life into the world is another story altogether. Make sure that you’re offering extra help to new moms that are recovering from a cesarean section, as she will likely have restrictions contingent upon her recovery. Looking Out for Signs of Postpartum Depression – No matter how much a new mom reads about recognizing the signs of postpartum depression, it’s not always easy to self-diagnose such a serious condition. This especially holds true when her feelings are being dismissed by other moms in her social circle as the “baby blues.” If you notice signs of postpartum depression, you can provide your mom boss with invaluable assistance by talking to her about it and letting her know that it’s okay to ask for help. Offering a Shoulder to Cry On – Dealing with the rigors of new parenthood while you’re holding a baby that simply won’t stop crying is enough to bring even the strongest mom to tears. While nannies are encouraged to establish and maintain professional boundaries, there is quite a difference between listening to a mom boss dish about her personal life and being there for her when she needs to vent a little bit. New moms don’t always feel comfortable opening up to their partners or family members, which leaves you uniquely positioned to offer them the support they need. Giving New Moms Time to Sleep – Some parents will hire a nanny to look after their baby at night for sleep training purposes, even when they’re planning to be home. Others will wait until the last possible day of maternity leave to turn their precious baby over to a childcare provider. Even if you’re chomping at the bit to get home after a long day of work, one of the best ways you can support an exhausted new mom when she returns home is simply allowing her an hour or so of uninterrupted sleep by sticking around with the baby for a little while longer. Helping Mom Learn the Ropes – While most brand-new moms aren’t eager to admit that their nannies know more about childcare than they do, some will quietly take parenting cues from the professional under their employ. Be sure that you make yourself available if your brand new mom boss is looking for help in terms of learning the basics, especially if she’s far away from family members or friends that could help. Taking Plenty of Pictures – Your mom boss will have to tear herself away from her new baby to go to work each day, and will almost certainly hate feeling as if she’s missing important new developments. Even if the most advanced thing your infant charge does over the course of a day is discover that she has feet, make sure that you document the occasion with plenty of pictures for mom to see when she gets home. Not Taking Jealousy Personally – No mom wants to leave the lion’s share of parenting responsibilities up to an employee, regardless of how experienced and competent a professional that employee might be. Try to take remarks made out of jealousy with a grain of salt until she’s had a chance to adjust to not only becoming a parent, but also being forced to leave her new baby behind each day. For parents who are vegan or vegetarian, raising their children with the same dietary habits may seem like a no-brainer. After all, it’s easier to fix one meal for everyone in the house when dinnertime rolls around, so feeding your kids the same vegetarian diet that you eat may seem like an obvious solution. The following blogs will explain what some of the concerns are with raising children as vegetarians and what you should keep in mind if this is something that you want to do. Some of these blogs will sing the praises of a vegetarian lifestyle, some may point out some information that you didn’t know, and some will give you some helpful tips on how to raise your child as a vegetarian, complete with kid-friendly food suggestions. 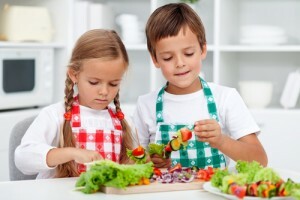 If you are considering switching to a vegetarian diet for yourself and are wondering what some of the concerns are for raising your kids as vegetarians, these five blogs will help you pinpoint the things you should be concerned about as far as maintaining healthy kids. Can Vegetarian Diets Be Nutritionally Complete? This blog quotes different medical sources to give you a viable source of information that shows that, if done right, a vegetarian diet can be nutritionally complete. Is a Vegetarian Diet Safe for My Child? This blogger details how to go about making the right choices when it comes to feeding your child a vegetarian diet, with one of the keys being advance planning. Ask the Doctor: Does My Child Need to Take Vitamins? Set up as a question and answer format, this post uses answers from a medical doctor regarding if and when vitamins are needed for children eating a vegetarian diet. 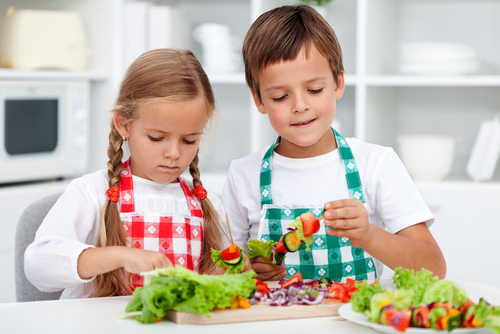 Vegetarian and Vegan Diets for Children: Are they Adequate? Sources like the ADA (American Dietetic Association) and the AAP (American Academy of Pediatrics) are used to show that adequate planning must go into meal planning for children so they get the nutrients that they need to grow. Is it Safe to Feed Children a Vegetarian Diet? Again, planning is emphasized in this article, along with what a child needs in order to grow properly. Getting enough calories is another concern that is tackled in this post. The same benefits adults get from eating a vegetarian diet apply to children. However, there are added benefits that you may not have considered before. Meat contains a lot of hormones, and those hormones have been blamed for causing early puberty in meat eating children. Read these five blog posts for more benefits of raising your child as a vegetarian. Is Your Child’s Happy Meal Causing Early Puberty? Obesity and Happy Meals have both been linked to early puberty in girls, and hormones in meat have become a concern. By eating a vegetarian diet, children will not be exposed to the harmful hormones from meat, and they are far less likely to be overweight. Kids With More Healthy Diet are Smarter, Analysis Proves The benefits of raising your kids vegetarian are noted in this article, as well as how kids are smarter when they eat healthier than their counter parts who don’t eat well. If You’re a Vegetarian Should You Raise Your Kids Vegetarian as Well? Many benefits are listed in this blog post as to why you should raise your child as a vegetarian if you are one. The blogger does point out that it’s a personal decision and that there are things to think about before you decide. Will We or Won’t We: Raising Vegetarian Children This vegetarian blogger discusses her personal decision about raising her kids as vegetarians, using evidence from reliable sources to back up her decisions. Young Vegetarians! Share this With Your Kids… Part 1 of 2 A blogger mom of vegetarian kids gives facts about how her kids grew up vegetarian, such as that her son is 6’ 6”, athletic and has never eaten meat. She has a fun sense of humor, which makes reading the post that much more delightful. Once you make the decision to raise your child as a vegetarian, there are a lot of things you need to consider. These five bloggers will give you some information that you can use on your quest to get all of the right information for feeding your kids. How to Raise Vegetarian Kids Things you need to know, as well as tips about foods, are detailed in this post. Raising Your Kids Vegetarian? How to Do it Safely Making sure that your kids are getting the right nutrients and how to do that safely are covered in this blog entry. Vegetarian Diets for Children This blog lists many different sources of protein for your child, and touches on different ideas for ways to prepare food your kids will love. Kid Food: Snacks This bloggers gives some ideas for vegetarian snacks for your kids, sharing funny stories along the way. How to Raise a Vegan Child This blog contains informative pictures of food and a garden to support her story about how she raises her vegan kids.